It might've been the greatest game ever played. We'll never know. That greatest game ever might've been the only thing that would've matched the eight-month-long climb up the incline of the Frost Flyer rollercoaster. Everyone was waiting for the pure joy and euphoria of the drop, the moment offseason actually flipped to season, and the most anticipated one at Nebraska in years at that. Probably decades. "Coach, god bless you," Jim in Norfolk said during Scott Frost's call-in radio show this week. "I've been waiting for this day since Dr. Tom retired." That can't be true, I thought the first time I heard it. Who could've seen the next 20 years of Nebraska football coming? Who could've remained at a 7 on the Nebraska-season-opener-excitement scale for that many years, for that many new coaches, only to arrive at a 7 billion (my estimate) now? 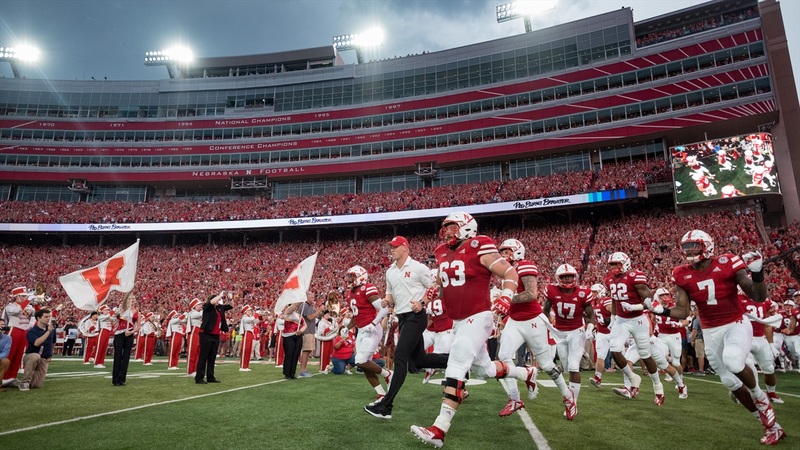 But when I heard it again –– not long after the game was delayed immediately following the opening kickoff, the Husker Sports Network went to a rebroadcast of the Nebraska Football Show as lightning continued to pop around Memorial Stadium –– I had nothing but time to consider it. Jim might've been right. Hence, decades. No, he was right. It wasn't that Husker fans weren't excited for other openers, other new-coach debuts, but that this was unlike anything else they'd ever seen. This run up to this season was unlike anything I'd ever seen, something I'd written multiple times since last December and said many more times on various radio appearances. Saturday night was supposed to be a start that was an end to all of that. Once the ball was kicked off the Frost Flyer could barrel down the hill at breathtaking speed, coast to the end and we'd have actual football to talk about. Impressions. Data. Game film. All that. Instead all anyone got to witness was a career day for Jerry Fitschen. Fitschen is Akron's sophomore kicker and the only actual actor in this particular non-game. His college career has spanned 27 games now and he's been involved in three plays. Sort of. He punted once as a freshman in 2016 against VMI for 29 yards and kicked off in that same game for 56 yards. That made his 65-yarder, the only play on Saturday night, a career long. It was a great kick; into the end zone, away from Nebraska return man JD Spielman. Smart considering Spielman took his first touch of 2017, a kickoff return, back for a touchdown. And that perfect kick on an imperfect night will be wiped from the record books. Once Akron-Nebraska was finally canceled, it was declared no contest. The only stat recorded in the game never happened on a night that was supposed to be unlike any other. Though I guess it ended up being that. Nobody will forget where they were when Frost's first game was canceled. They weren’t in Memorial Stadium. It had been cleared out for safety precautions about an hour before the officially official announcement. Even that had something of a false start. At least the much-talked-about Tunnel Walk made its debut. It was good. I think. New in parts, with references to the old. That’s supposed to be the logline for this whole Frost-is-home story. We’ll just have to wait another week for it to get started. Hang in there, Jim. You’ve waited this long. Day by day, as they say.